This German Renault Panzerjäger 35R Panzerkampfwagen 35R 731(f) Tank Destroyer can be found at the Swiss Tank Museum in Thun, Switzerland. 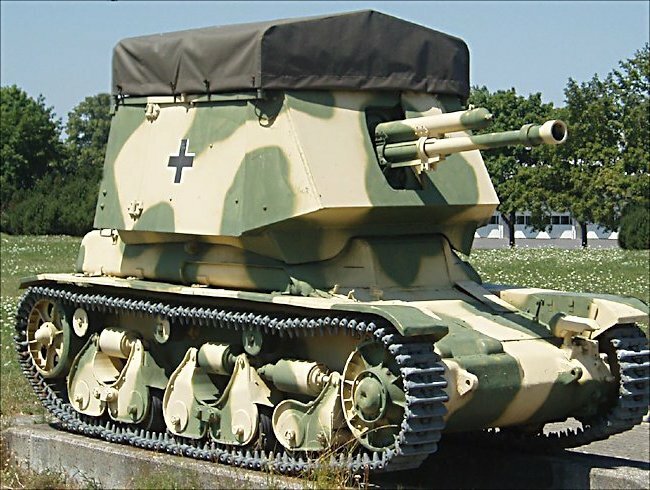 The Germans used the captured Renault R35(t) tanks and installed a Czech Skoda 47 mm PaK L/43.4 gun on top of the chassis to produce this self propelled gun. German Renault Panzerjäger R35 Panzerkampfwagen 35R 731(f) Tank Destroyer. After the fall the of France in 1940 Hitler started to draw up plans for the invasion of Russia. This was going to be called operation Barbarossa. He needed many more armoured fighting vehicles. Converting captured enemy tanks and anti-tank guns into panzers was a logical step. They had 843 captured French Renault R35 tanks sitting in storage areas doing nothing. They also had a large number of Czechoslovakian made infantry 47mm kanon P.U.V. vz. 36 (Škoda A6) anti-tank guns. A decision was made to up gun the Renault R35 tank by converting it to a tank destroyer. The gun was too big to fit into the French tanks turret so it was removed and protective armour plating was fitted around the new gun. As with all German early tank destroyers the Panzerjager 35R had a high profile. This meant it was easy to spot and quickly became a simple target for the enemy to find. The fighting compartment was open at the top. This meant the crew were exposed to the elements as well as at risk from shrapnel and handgrenades. Some Panzerjager 35R crews rig canvas sheets over the top of the fighting compartment to give some protection from rain and snow. It did not turn out to be a very effective tank killer. The main reason was it's very slow speed. The French Renault R35 tank had been designed as an infantry support weapon and therefore only needed to go up the pace of attacking infantry. Unfortunately tank destroyer tactics meant that it needed to keep up with the faster tanks at the front of the blitzkrieg spearhead. The Panzerjäger 35R Panzerkampfwagen 35R 731(f) was totally incapable of doing this. This defects became apparent when it was deployed in Panzer divisions fighting in operation Barbarossa. Around 174 Panzerjäger 35R tank destroyers have been built. They were withdrawn from main battle groups and sent to occupied territories to assist in policing actions and general defence. When the allies attacked in June 1944, the Panzerjäger 35R saw action again, this time in a defensive role. The allies also encountered them during operation market Garden, the attack on the bridge Arnhem.